Watching History Channel's "Epic History of Everyday Things". Coffee, canning, razors, mirrors, beer, etc. And "Nightsoil" - the history of managing poop during the Industrial Revolution. The Epic History program recalls the importance of things, the controversy of things, now taken for granted. How Venetians kept all the glass makers on a small island (Murano), populated with assassins, to keep anyone from learning the trade secrets around glass. Similarly, how coffee beans and seedlings were smuggled away from kings and holy men intent to keep the coffee a secret... and the pilferers built stone castle walls around the transplanted coffee bushes in South America. How a $40k reward offered by Napoleon led to the invention of canning food, and how that made moving troops - and colonization - possible. The segment on the epic history of the flush toilet hit home. The "Great Stink of London" occurred from rapid deployment of a new technology. It begins with the old system of "night soil" workers, who had to climb into sewage pits (cesspits) at night to empty people's sewage by bucket and rope. The nightsoil workers were paid 4 times the average wage - a "good job" if your definition is pay. Then, there were "Toshers" who were unpaid, but had the rights to run their hands through the sewage for the profit of finding lost rings, coins, metals, and other valuables. Then the flush toilet came to the upper classes in 1815. There was no sewage system designed for the amount of water these used, so they were flushed into the same cesspits, which quickly overflowed into the rainwater runoff system. Since it was just a few people who had the systems installed, no one made much of the fact that the toilets flushed into the Thames River, the same source of water they were withdrawing. But within 7 years, the Thames River of London became so polluted, as the toilet access expanded, that cholera epidemics broke out over the next several decades. The same epidemics occurred in the USA - H.L. Menken described the City of Baltimore as smelling "like a billion polecats" in the 1880s. 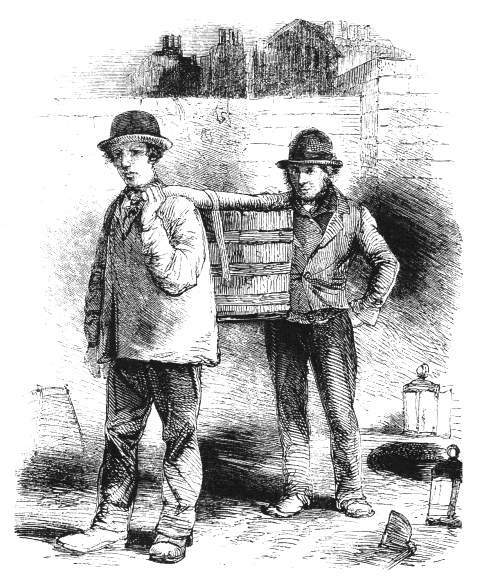 The "Great Stink of London" made papers for river pollution and nastiness, but the connection between the poor sewage and cholera wasn't understood until all the nightsoil workers and toshers were well out of business. The flush toilets made the job of harvesting nightsoil impossible. But like modern shredders, they looked much better than the system they replaced, and displacing nasty tosher children was a the primary benefit to the snobby class - before all dysentery hell broke loose. I'm not sure I have the writing stamina tonight to weave the historical connections between "e-waste" and human waste... but my recent series on river pollution (E-Stork 1-4) and tracing causes upstream, and the way industrial revolution volumes of waste (textile, e-, or human) deluged the workers' systems which had been working, they all fit here. Guiyu, I'd suppose, was a system of chip harvesting and recycling that probably worked, creating jobs which paid at least 4 times the going wage in southern China, just like nightsoil workers and toshers. We mistake making "poop go away" with making sewage management go away... and so we are doing with e-waste, with all the snobby distain for the working class that came upon the nightsoil workers of Thames London. I would suggest that serious researchers of "e-wastes" get over the Daniel Tosh giggles and study the environmental and social history of sewage. How regulation of sewage involved social stigmas and social pecking orders, how toshers and night soil workers were (like the black leg miner) regarded by society, how "new technology" like flushing toilets was initially embraced as a social status, and how the "resources" like the river Thames were taken for granted... how water pricing and water policy was behind the rapid exploitation of the river and deluge of the Tosher society, and how many decades it took to understand where Cholera was coming from. They may do a lot to help China's water policy today (also E-Stork I). The Wikipedia article on the spread of cholera and disease which followed the novelization of flush toilets, and the wetting of "cesspits" into overflowing pools, overflowing into the floorboards in neighborhoods like Soho, identified how people like Filippo Pancini and John Snow were ignored, or out-marketed, by the new "flushing toilet industrial marketing complex". The technology and convenience of flushing toilets, the absence of "dirty children" and Toshing and nightsoil workers, all made the discovery of water policy take a generations longer than it should have. I've always blamed the General Mining Act of 1872 - artificially low costs of natural resources - for the invention of "waste making"... I've done that since I started recycling, in speeches I gave to Garden Clubs in 1979. But History's description of jealously guarded coffee beans and mirror glass production also fits Vance Packard's "Waste Makers" thesis. USC Professor Joshua Goldstein is someone I met in CA this year. He described to me his study of Beijng/Peking "nightsoil" worker culture over lunch a few months ago, and the fascinating way Mao elevated the "Chinese Tosher class" in the Communist Party to demonstrate social mobility. I know how surplus property gets deluged, how reuse systems can be overwhelmed as gently used technology is flushed out by Moore's Law progress. Some years ago I wrote about how to distract a Technician working on a Pentium 3... by putting a Pentium 4 on the table. 40 minutes into the P3 repair, that work goes on the back burner and the P4 becomes the center of attention. Like water rising in the cesspit, turning pits into pools, I can see how a reuse market could become overwhelmed by the rapid flushing of technology and surplus property. I'm not saying that everything was working and the Guiyu techs and African geeks could have done this on their own, as floodgates of gadgets descended, any more than nightsoil and tosher technology could have managed the pay toilet. But I am saying that mistaking a flushing toilet displacing a nightsoil worker for "progress" makes about as much sense as promoting climate change to protect against polar bear attacks. Fair Trade recognizes where the Techs can become overwhelmed by volumes, and by their own 10-year wave of discards, and work with them to incorporate them into the system. Had London harnessed the nightsoil workers, and involved them, instead of treating them as "competition" for the modern toilet makers, millions of lives may have been saved. Like the Chinese struggle to assign value (free market) to water resources (discussed last week after the Middlebury College "China Town Hall" symposium with Zbigniew), and like the myth of "free" water from the Thames in 1815, we need to first recognize the true cost of hard rock metal mining. We need to address the coltan and tantalum mining in the African rain forests, the use of mercury amalgam to fetch gold in the Congo and Amazon River basins, the mining of coral islands in Indonesia to feed our "leadfree" fashion. We need lifecycle analysis, which always fits with carbon analysis and climate change. If the price of the water is correct, people won't ruin the water. If the price of mining copper, tin, silver, gold, etc. is correct, the recyclers and tinkerers and refurbishers will be profitable enough not to be overwhelmed. Flushing toilets don't have to be a bad thing, just as internet and technological development brings good things. But connecting the dots between waste and Toshers, miners and recyclers, is too important to get wrong for a whole decade. Sustainability and Recycling are connected, both upstream and downstream. Weather water is polluted by copper mine tailings or textile mills or the advent of flushing toilets, environmental science needs to approach the problem as western medicine approaches health.. not by scapegoating the underclass, but using dialectic and evidence and dialogue to improve management of the system. The Reverend Henry Whitehead was an assistant curate at St. Luke's church in Soho, London, during the 1854 cholera outbreak. A former believer in the miasma theory of disease, Whitehead worked to disprove false theories, eventually focusing on John Snow's idea that cholera spreads through water contaminated by human waste. Snow's work, particularly his maps of the Soho area cholera victims, convinced Whitehead that the Broad Street pump was the source of the local infections. Whitehead then joined with Snow in tracking the contamination to a faulty cesspool and the outbreak's index case. E-Stork 4: It's the Journalism, Stupid. How E-Stewards Made Me Rich?